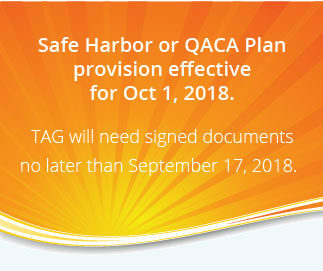 The 2018 New Plan Safe Harbor or QACA Plan provision effective for Oct 1, 2018, TAG will need to have the signed documents no later than September 17, 2018. General Rule: Generally, the safe harbor notice must be provided within a reasonable period before the beginning of the plan year. The timing requirement is deemed to be satisfied if the notice is provided at least 30 days (and not more than 90 days) before the beginning of each plan year. If the notice is not provided within this time frame, whether the notice is timely depends upon all of the relevant facts and circumstances. If the employee becomes eligible after the 90th day before the beginning of the plan year, the timing requirement is deemed to be satisfied if the notice is provided no more than 90 days before the employee becomes eligible and no later than the employee’s date of eligibility. This rule also applies to the first plan year of a new 401(k) plan, with respect to employees for that first plan year. In some cases, it may not be practicable for the notice to be provided on or before an employee’s eligibility date. This is likely to be the case for a plan that allows an employee to participate on his or her date of hire. The regulations state that, in this situation, the notice will nonetheless be treated as provided timely if it is provided as soon as practicable after that date and the employee is permitted to elect to defer from all types of compensation that may be deferred under the plan earned beginning on the employee’s eligibility date. QACA Notice: A QACA notice satisfies the timing requirements only if it is provided sufficiently early so that the employee has a reasonable period of time after receiving the notice to elect changes to the automatic contribution and/or investment. The plan may not permit a default election effective any later than (1) the earlier of the pay date for the second payroll period that begins after the date the notice is provided, and (2) the first pay date that occurs at least 30 days after the notice is provided.